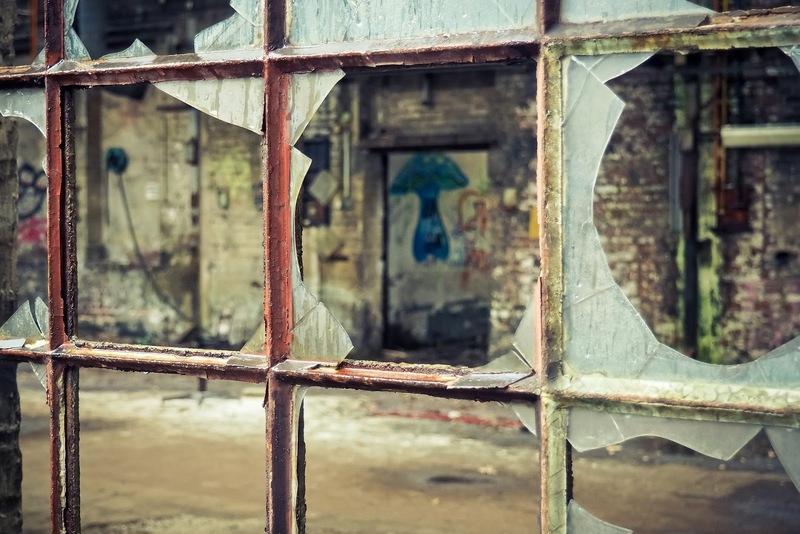 Have you heard of the Broken Windows Theory? If so, do you have any broken windows in your company? Don't know what the Broken Windows Theory is? It's a hotly-debated theory in criminology that, in short, states that if a community tolerates minor crimes, e.g., broken windows, graffiti, or turnstile jumping, more and larger crimes will likely ensue. Give them an inch, and they'll take a mile. I know, I know. Every once in a while, I bring up something odd, and you sit there asking yourself, "What has she gotten herself into now?" Bear with me. This is a good one. Consider a building with a few broken windows. If the windows are not repaired, the tendency is for vandals to break a few more windows. Eventually, they may even break into the building, and if it's unoccupied, perhaps become squatters or light fires inside. Or consider a pavement. Some litter accumulates. Soon, more litter accumulates. Eventually, people even start leaving bags of refuse from take-out restaurants there or even break into cars. 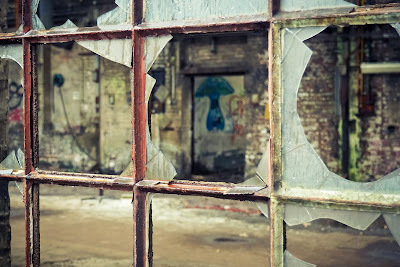 Under the broken windows theory, an ordered and clean environment – one which is maintained – sends the signal that the area is monitored and that criminal behavior will not be tolerated. Conversely, a disordered environment – one which is not maintained (broken windows, graffiti, excessive litter) – sends the signal that the area is not monitored and that one can engage in criminal behavior with little risk of detection. It reminds me of that one bit of yarn on your sweater that needs to be tied off before the entire garment unravels. An ordered and clean environment – one that is monitored and maintained – sends the signal that the customer is important and central to the business and that a poor customer experience will not be tolerated. Conversely, a disordered environment – one that is not monitored and maintained (rude staff, dirty bathrooms, long wait times) – sends the signal that the customer is not important and that one can have a bad experience with little risk of detection. Don't ignore the small things. Customers see and remember the small things. The small things may not be "just small things" to your customers. Fix the small things before they become big things. The details matter. It's all about the details. Everything you do (or don't do) signals the customer about where your priorities lie. Monitor your customer interactions. Listen to customers. Act on their feedback. A customer-focused and customer-centric culture is really a series of little things, all done well, all done right. A series of little things, all done right, sounds like consistency to me. Consistency leads to trust. And trust is a crucial part of the relationship your customers have with you, and vice versa. Don't tolerate broken windows. Fix them - before the entire building collapses. Are you in the process of shifting the thinking within your organization to create a customer-focused culture but don't know where to start? Help is on the way. 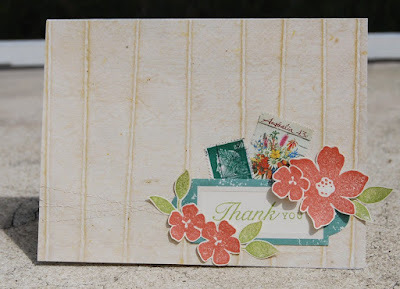 Yesterday, I shared a guest post by Jeff Toister. One day earlier, I attended a Sales Leadership Alliance meeting in Irvine, CA, where Jeff spoke to the attendees about the journey to a customer-focused culture. This topic clicks with me for a variety of reasons, not the least of which is the title of my blog! And as a reader, you'll want to hear more from Jeff after this. In his presentation, Jeff focused on the first three steps in the journey to a customer-focused culture, and hence, to outstanding service. How does that saying go? If you don't know where you're going, how will you know when you get there? Or, if you don't know where you're going, you'll end up somewhere else? Either way, you need to establish and communicate a clear definition of your customer-focused culture so that employees know what is expected of them and know how they will contribute. The definition must: (1) be simple and easy to understand, (2) describe the type of service we want to deliver for our customers, and (3) consider both present and future states (how we look today and what we aspire to be in the future). Define what the destination will look like for your organization; don't copy or imitate what others are doing. Jeff cited the example of a retailer that claimed they were "the Nordstrom of patio furniture." Huh? To execute: provide clear direction, define outstanding service, link behaviors by telling stories and providing real-life examples, and discuss frequently. I like this point that Jeff made: The things you talk about a lot are deemed important to employees, and employees realize the things you don't talk about are not that important. Consider that for a second. I'm guessing it probably speaks volumes to many of you. A customer focus and great customer service cannot be a flavor of the month; it's an ongoing, day-in day-out commitment. It's a journey. Plain and simple, we need to know that we're headed in the right direction. What gets measured gets managed. What gets measured gets done. It gets done because you're tracking progress and, again, you know if you're going the right way. The scorecard, the metrics - those are mile markers, not the destination. So establish some goals aligned with achieving your destination and measure and manage against those goals. Don't just write them down and forget about them; don't just communicate them once and never again. They must be visible and talked about regularly. They focus attention on the desired behaviors rather than diverting attention from the big picture. They promote teamwork rather than individual outcomes. They motivate intrinsically rather than relying on external rewards to drive performance. Before you can win the moments of truth, you must first identify them. Once identified, measure performance at those moments and fix any obstacles that keep your employees from delivering the experience expected by your customers. In addition, ensure that any decisions, processes, etc. about these moments align with the company's definition of great service. For more details, check out Service Failure. Jeff filled it with great real-life examples, many from his own experiences (good and bad) throughout his own career in customer service and training. Today I'm pleased to share a guest post by Jeff Toister. I recently traveled overseas and had to get a loaner phone from Verizon, since my iPhone wouldn't work in the UK or Ireland. 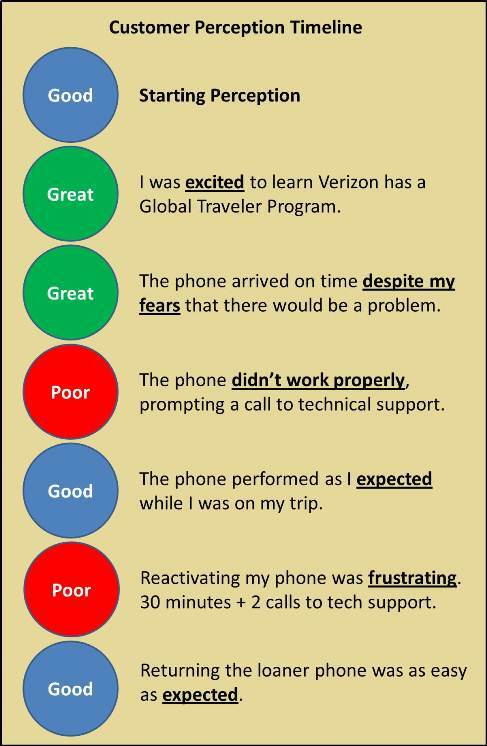 If Verizon had sent me a net promoter-style customer satisfaction survey about their Global Traveler Program (they didn't), I'd probably give it a 7. You can get an overview of Net Promoter scoring on the Net Promoter System website, but a 7 is a relatively neutral score. It may be tempting to classify my service experience as good, but not great. 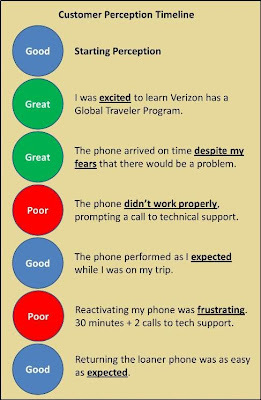 However, my slightly positive overall perception of Verizon's Global Traveler Program is really a rough average of elements that were truly fantastic as well as some frustrating service failures that greatly diminished my enthusiasm. In other words, Verizon was one step away from either turning me into an enthusiastic promoter or an angry detractor. Customer service is a function of each individual customer's expectations and experience. Outstanding service happens when experience exceeds expectations, while poor service is the result of experience falling short of expectations. What happens most often? Good service. This is when the experience meets expectations. There's nothing wrong with good service per se, but it isn't memorable. We only tend to notice, and remember, service that's outside the norm. My perception of Verizon's Global Traveler Program was really a collection of experiences. There were at least seven distinct moments of truth that shaped my overall impression. My overall impression of Verizon's Global Traveler Program wasn't just impacted by the average of each moment of truth, but by their sequence. Starting Perception. This signifies where a customer's perceptions are at the start of the experience. 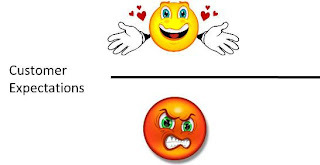 Good (neutral) impressions are relatively easy to sway, but strong perceptions are not. That's because a phenomenon called confirmation bias causes customers to selectively filter out information that doesn't match their existing beliefs. If they're a raving fan, they'll look for evidence that Verizon is awesome. If they hate Verizon, they'll look for any little nitpick to justify their feelings. Primacy. My first two experiences with the Global Traveler Program were great. Since my starting position was neutral, I was easily moved into a 9 or 10 position on a 10-point scale. First impressions are typically the most memorable, so a strong first impression can heavily influence a customer’s overall perception. Mid-point. The two poor experiences were sandwiched between neutral or positive experiences. This, combined with an outstanding first impression, likely prevented my overall perception from being in the 4 or 5 range. Recency. My last moment of truth was good since it was relatively easy to return the phone. Customers tend to remember their first impression and their last impression, so a good beginning and end can help overcome a few negative experiences in between. 1. Good service can hide distinct opportunities to be either great or terrible. 2. Companies should fall all over themselves to make a great first and last impression. 3. It's a good idea to collect data that goes beyond an overall impression to help you spot the strong and weak points in your service delivery system. What other lessons can companies learn from this experience? This post was originally published on Jeff's blog and is reprinted here with permission. 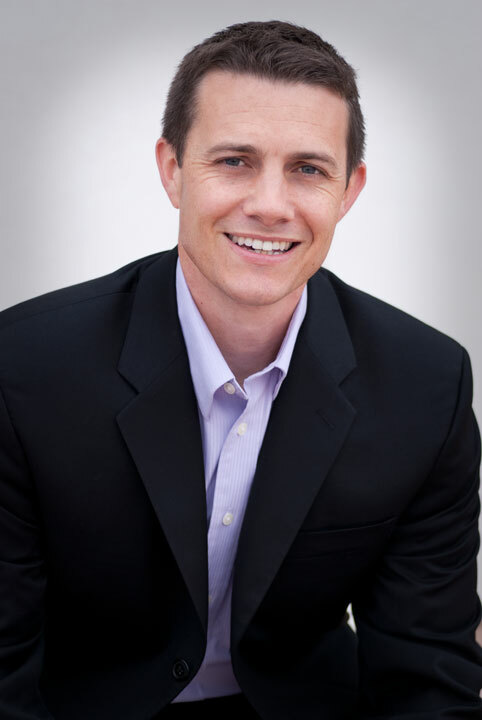 Jeff Toister is the author of Service Failure: The Real Reasons Employees Struggle with Customer Service and What You Can Do About It, a book that reveals hidden obstacles to outstanding service. His company, Toister Performance Solutions Inc., helps clients identify these obstacles so they can improve customer service. Companies Take Note: Don't Remove Human Touch, Please! On the heels of my post a couple weeks ago about humans vs. technology in delivering a great customer experience, I thought I'd share some human touch articles of late. Several were shared with me as a result of that post, but I found a few others along the way. Is anyone surprised? It seems we all still prefer the human touch. Before I share the articles, I wanted to give an example of where technology often creates more frustration than it helps to facilitate a great experience: those grocery store self-checkout lanes! I just went through one last night, and the scanner invariably failed: it gets "stuck," can't recognize bar codes, thinks you put something in a bag when you didn't, can't make sense of coupons, glitches, etc. As a matter of fact, I can count on it failing. This is the wrong kind of consistency in the customer experience! By the way, other than those problems (they are fixable, so let's get them fixed! ), I love the convenience. I was bummed when I heard that they were going to remove those self-checkout lanes from my local grocery store. I'm so glad they haven't yet because when it works the way it should, it's awesome. When it works. OK, on to the articles I wanted to share. The first one comes from MyCustomer, "Customer Service: Six Ways to Provide the Human Touch." Ironically, it was published the same day my original blog post did. While it's not focused specifically on humans vs. technology, there are some nice tips here on the human touch. Next up is a Fast Company article shared by Greg Richardson titled, "The Four Things People Can Do Better Than Computers." While the list is short - as the subtitle states, "Yes, it's down to four. You better be good at them." - it's a solid list. James Lawther shared a Ted Talk by Shyam Sankar titled "The Rise of Human-Computer Cooperation." Great video and well worth the 12 minutes to view it. The next article comes from Adrian Swinscoe: a blog post of his own called "Customers Behaviour and Their Customer Service Choices Trump New Technology Every Time." He includes an infographic from Parature that takes a look at the evolution of customer service. All4Service shared this blog post with me: "The Importance of the Human Element in Customer Service." They give us three reasons that technology will never trump the human touch. The next article is one from Credit Union Magazine about "Humanizing Service in the Age of Technology." The banking industry is one largely affected by this humans vs. technology debate. Some good stuff here. You may have seen the videos in this next post, from CX Next: "Humanizing Technology for Better Customer Experiences (Literally)." The videos capture both sides of this debate. Very clever. The next article is about another industry where the humans vs. technology in customer experience debate is prevalent. Who does it best: the kiosk spitting out your ticket or the agent helping you with your bags? Quality Hunters presents a nice overview on this topic in "Technology vs. Human Touch." I like the closing statement on this article by Questar titled "Customer Experience in Our High Tech/High Touch World," where industry expert Tom Feltenstein states: “It’s only through a human touch, whether facilitated by technology, or a face-to-face interaction, that you are able to create a real emotional connection that will engage your customer and build sustainable loyalty." The Advanced Human Technologies team put together this interesting article that looks at the trade-off between efficiency and relationship strength: "Creating the Future of Customer Relationships." This Forbes article takes a different angle, but one still worth including in the mix and reading: "Investing At The Corner Of Technology And The Human Experience." This article posted on Customer Service Zone is another take on the humans vs. technology for the betterment of the customer experience: "Has Technology Improved the Customer Experience in Most Companies?" And, finally, one last place to look for technology and the customer experience: Micah Solomon's book (for which you can download a free chapter here), High-Tech, High-Touch Customer Service. 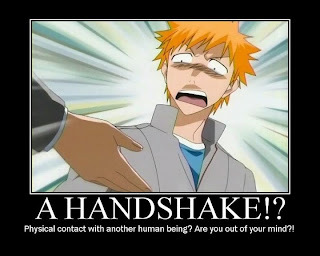 I think the human touch is here to stay - by popular demand! Technology, assuming it works well, will certainly facilitate a great experience, but I think it will be a long time before it replaces the human experience. How engaged are your employees? Do you have a way to accurately measure their engagement levels? 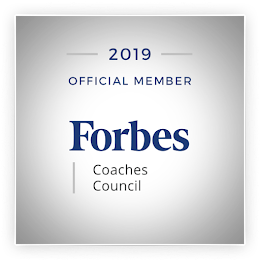 How do you create a culture of "living the brand" that leads to engaged employees and customers as well as financial rewards for the business? Curious about those "three words" I mentioned in the title? Remember them: Live. The. Brand. It's a theme that Gregg builds on and refers to often in the book. It's not a new concept for Gregg, though, as he wrote about it in his first book, Achieve Brand Integrity, as well. You know me. I'm a fan of consistency! What does it mean to live the brand? According to Gregg, it means "you KNOW the mission, values, brand positioning, guiding principles, etc. that your company has announced to the workforce and marketplace and you know how to DO them in your day-to-day job." Or, said differently: "when your employees KNOW the brand and DO it consistently by making it a part of their everyday lives at work." One of my favorite concepts in the book, something he mentions frequently throughout, is the secret to success: 1% training and 99% reminding. (Perhaps that's why he mentions it so frequently throughout the book!) The things you think may be common sense are not common practice. And ongoing communication and reinforcement are key. There are so many great things that I could share about this book; it is an easy-to-read handbook to guide you through your quest to create the ultimate customer experience through engaged employees who live the brand. Gregg's writing style is fresh and engaging. He provides sensible diagrams, how-to lists, examples, step-by-step guidelines, and links to online resources to support the approach. 1. Get every employee on stage, delivering the experience for customers. 2. Make happy employees to create engaged customers. 3. Don't just announce your culture, make it visible. 4. Sprint from culture talk to culture change. ... while the other four, in the second half of the book, are devoted to quantifying and linking to financial results. 5. Quantify your culture to turn common sense into common practice. 6. Any monkey can survey; start building relationships with customers. 7. Put the carrots away; rewards don't work the way you think they do. 8. Manage the experience to build trust in you as a leader. Speaking of quantifying, there are no black box metrics here to measure engagement; in the chapter that explains Principle 5, Gregg tells the backstory about the Engaged Index, which questions to ask, why, how to ask them, and how the index is created. I like the theory behind why the questions are asked the way they are asked; it makes total sense to me. Here are the four questions, which are rated on a 10-point scale, where 10 is something you would definitely say. I am motivated to go "above and beyond" what is expected of me at my job. I would stay with my organization if offered a similar job elsewhere for slightly higher pay. Assume that a friend or family member of yours is currently looking for a job and qualifies for an open position at your company. How likely is it that you would recommend it as a place to work? Assume that a friend or family member is interested in your company's products and/or services. How likely is it that you would recommend them? 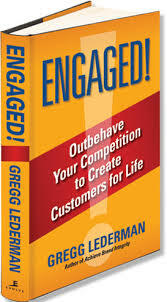 One of the online resources that Gregg offers to supplement the book is a website called Engaged Index. You can go to this site to answer the four questions about yourself to determine how engaged you are relative to others at your company or to the rest of the world. Even though you have to enter your company name (so that a score can eventually be generated for your company), no other personal information is required; the survey is anonymous. There's so much good stuff in this book that I'm going to go back and read it again. If you want more details, go to the Engaged Book site. Taking a page out of the Index, I am assuming that you are interested in this book; I would definitely recommend reading it! Can technology replace humans to provide a better customer experience? This has been an ongoing discussion for the last year or two, especially as technology evolves and new tools surface: can technology alone deliver a customer experience that is as good as, or better than, what a person can? Last August, Bob Thompson of CustomerThink reached out to several customer experience thought leaders to get their opinions about technology and the customer experience. I was among the group that contributed to his post. Part of my response: "In order for technology to come close to delighting, you have to first train it or teach it what will delight you." Technology is an experience enabler, a "supporting cast" of sorts. I think there are definitely times when customers need that human touch, that warm smile, the ability to reach out and touch someone, should they have a question or an immediate need, especially one not easily solvable with technology. I don't think the need for relationships or the human experience will go away. Sometimes you just need to have a conversation. In order for technology to fulfill that need for a personal/personalized experience, it needs to be trained or programmed. You need to tell it what your preferences are; while we need to do that for humans, too, in theory, humans already come wired with compassion and some common sense (hopefully), such that we don't necessarily need to reprogram/train them. At the very least, we can hire for the right attitude. I'm not an Ally Bank customer, and I'm not necessarily a fan. (They used to be GMAC. Remember them and their reputation?) But I laugh at their recent/current commercials ("Your Money Needs an Ally"), especially the one that touts: "Helpful People. Not Machines." Without a doubt, every time I see it, I remember some of the conversations being had around this topic. For a little background, Ally is a branch-free bank; this fact alone automatically makes one ask: "If they don't have branches, then they've just eliminated all human interactions, no?" According to their website, though, they do offer 24/7 live customer support by phone. And Money Magazine has rated them Best Online Bank for two years in a row. They have won a ton of awards, including Forrester's 2013 Outside In Award, so they must be doing some good things. Can technology provide experiences that clearly demonstrate the company's focus on attention to details? Can it build customer trust with/for the organization? Can technology create an emotional connection for the brand? Can it be flexible and adaptable, given the varying needs of customers? Can it read human emotions and diffuse a volatile situation? Where do you stand on this topic? Are we in for a future where we're only interacting with iPads, IVRs, and robots? Or are human interactions still a requirement for ensuring great experiences? 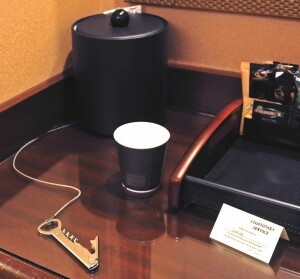 Do you have any examples of cool new technology that really added an element of delight to your experience? Today I'm pleased to share another guest post by Micah Solomon. To build customer loyalty, start by making a decision: Are you willing to put the customer at the center of everything you do: at the center of your company or department, your daily routines, the way you hire, the way you design your webforms? Don’t say “yes” too automatically. Putting the customer at the center is a more complicated, subtle, and arduous adventure than it sounds. But it’s worth it: At each successfully customer service-oriented company where I’ve bought stuff, worked as a consultant, or used as a customer loyalty case study in books or as a keynote speaker, somebody (or some somebodies) has made this decision. If you’re willing to make this decision as well, we can get down to business. Just how do you go about putting the customer at the center of your operation? Waving your hands around, chanting “oh holy customer, thou art at the center of my universe” isn’t going to be sufficient, or advisable. What you need is to appropriately direct your resources and your employees to a framework that can dependably, repeatably satisfy your customers. Do this by making sure you’ve covered the four elements of a satisfactory customer experience. …no product is perfect if it’s presented to the customer in a way that doesn’t appear to be “caring” to the intended recipient. No matter how delicious the food, no matter how safe the jet travel, if it’s presented in a way that doesn’t show care for the customer, it’s not going to be a hit. …a perfect product or service delivered on a timetable that doesn’t match your customer’s expectations is a defect. And customer expectations in the area of time have recently ramped up astoundingly. Factors that range from amazon.com to the smartphone revolution to global competition to customers with complicated work schedules have led to a ramping up of what customers expect in terms of timeliness in nearly industry. …because you will, sometimes, be late/uncaring/imperfect. An effective and complete problem resolution process includes documentation and other oft-overlooked steps but most importantly starts with an emotionally-resonant apology - what I notoriously refer to as the “Italian Mama Method” of comforting a customer. as in, you’re creating an environment/product/process/service that “feels like home” to your customer. Now, if you think about it, customers don’t actually want the place they do business with to “be like home”– dirty dishes in the sink, deferred maintenance up the yin yang. So I use this “home” term advisedly and with some apprehension. What I mean by “like home” is what Horst Schulze meant by “like home” when he created the Ritz-Carlton brand: an experience that is like being a kid in the home of a caring parent: your preferences are attended to (there’s food in the fridge that is to your taste), you’re missed when you leave and sincerely welcomed back when you return, the maintenance is done without you even noticing. This is what “just like home” means to a customer and what can turn a customer into a loyalist and ambassador for your brand. There’s a lot involved in creating a true loyalty-building, “homelike” situation for your customers, and I’ll be exploring it over the course of these posts. But I hope the homebuilding metaphor will give you a place to start: When you conclude an interaction with your customer, let her know that it matters to you that she come back soon. (I’m assuming here that you’re not a surgeon or an undertaker.) And when that customer returns from an extended absence, let her know that she’s been missed. Most of all, work on fulfilling, in that great phrase of The Ritz-Carlton, “even the unexpressed wishes” of your customers. Customers shouldn’t have to draw you a diagram to get across what they want from you. Figure it out yourself. It’ll be worth it. This post was originally published on Micah's blog and is reprinted here with his permission. Micah Solomon, author of "High-Tech, High-Touch Customer Service," is the business keynote speaker, author, and customer service consultant termed by the Financial Post "a new guru of customer service excellence." Solomon offers speaking and consulting on customer service issues, the customer experience, and company culture - and how they fit into today’s marketing and technology landscape. An entrepreneur and business leader, he previously coauthored the bestselling "Exceptional Service, Exceptional Profit." What Makes It the Greatest Customer Experience on Earth? Do you know what comprises the greatest customer experience on earth? I do. I've seen it twice! "What? What are you talking about, Annette? Have you been keeping secrets from us?" 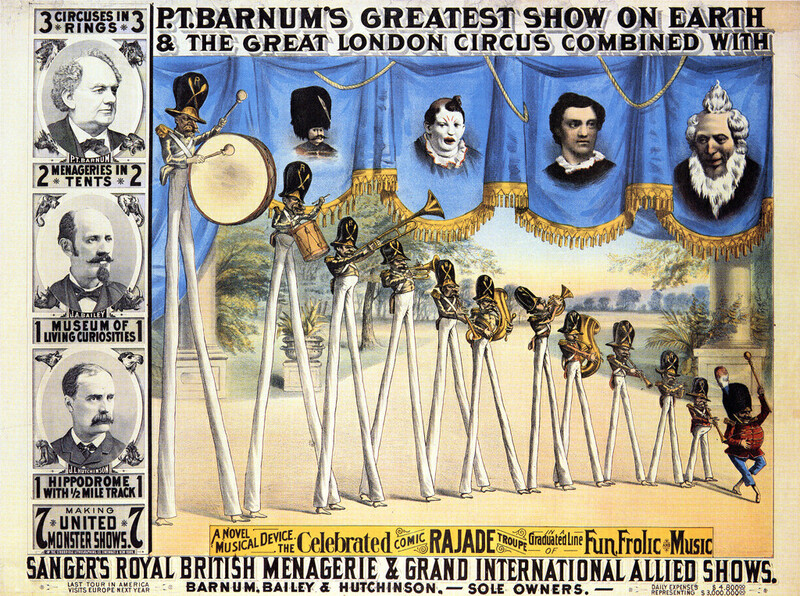 Last summer, I took my kids to see a Ringling Bros. and Barnum & Bailey Circus show. They had such a great time and assured me they wanted to go again the next time the circus was in town. They even asked me last summer if they could go again, but the circus had already left. 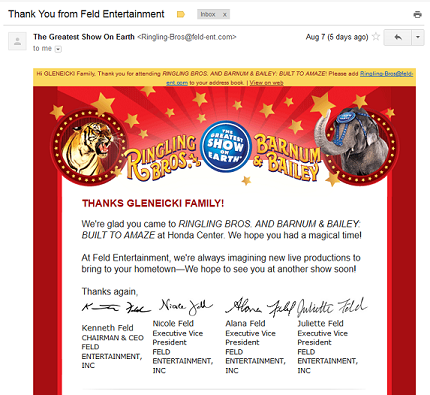 As soon as I saw that Ringling Bros. was coming to town this summer, I bought tickets for the three of us. Ironically, it was exactly a year to the date that we went last year. 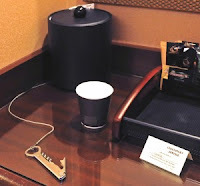 Of course, after last year's show, I was inspired to write a blog post about The Greatest Customer Experience on Earth. Sitting at the show this past weekend, I knew I'd need to write a follow-up post. Why? As always, there were lessons to be shared. Without a doubt, the circus covered all of these. Touching briefly on consistency, I think it is an "umbrella quality." What do I mean by that? Those other four qualities (and any other qualities you may use to describe your greatest experiences) need to describe your every experience with a brand. Always. Every time. Consistently. I think Ringling Bros. does consistency well; it was like deja vu all over again! I believe this was a delighter for my kids. Although they knew what to expect (always a good thing for kids) from the show in general - right down to PETA protesting outside the arena again - they were still surprised and delighted by the actual performances; they knew it would be great. Some of the other qualities of this great experience? In addition, the following people skills facilitated how well-orchestrated and seamless the show and the experience were. Adaptable/Flexible: If something didn't go as planned, e.g., when a tumbler didn't land as expected, they improvised and made it appear as if it was meant to be the way it was executed it. Never missed a beat. Communication: Announcements before and during the show helped to set expectations; they were proactive and framed as "here's what's about to happen and why." There were also announcements made for safety reasons. Teamwork: The different types of performers all worked together to ensure not only each other's safety but also the overall quality of the experience for their guests. Attitude: Right in line with teamwork, performers didn't take a "not my job" attitude; you could just tell that if one saw something out of line or if someone needed help, any and all chipped in. Speaking of people and people skills, let's not forget those unsung heroes of the circus, the pooper scoopers: dressed in black to also facilitate the seamless, well-orchestrated experience. As I noted in last year's post, their roles are not glamorous, but they are mission critical. Not only did they scoop the poop but they also set the stage, modified sets, and were like puppet masters for some of the acts. The really cool part is that they were dressed in black so as to not distract from the show. With a black floor and a darkened arena backdrop, these men and women were barely visible. And finally, any brand well-versed in the language of customer experience knows that listening to customers is essential. Like last year, we were given a card (the same card) with contact information (phone number, address, email address) to provide feedback about the show overall. What other qualities would you use to describe great experiences? In honor of Henry Ford's birthday this week, I thought I'd share some of his quotes that inspire me as a leader - and that relate well to the world of customer experience. Disclaimer (sorta): My dad worked for Ford Motor Company for 44 years; his brother worked for Ford for even longer! I'm a Ford girl. I strayed - once - but have since returned to the fold. My dad is happy. Back to the quotes. I think they speak for themselves, but I've added commentary to a few of them. Ford was an innovator and perhaps seems to have been a bit ahead of his time. He was inspirational, forward-thinking, and wise. I love this quote, for a variety of reasons. Stop talking about it; just do it. Stay focused. Stay committed to your purpose. Distractions are toxic to the business. The customer isn't always right, but he is the customer. If you keep making the same mistakes, customers will lose patience, faith, and trust. Don't. If I had asked people what they wanted, they would have said "Faster horses." True. Some innovation comes from the minds of the business, but some truly does come from asking customers. I will never discount the voice of the customer in product or service innovation. Common sense. Where has it gone? While your competitors are still trying to figure it out, go make it happen. I love this quote. It's pretty self-explanatory. Vision and purpose trump strategy and culture. Without a vision, you'll end up as Yogi Berra says: If you don't know where you are going, you'll end up someplace else. Take care of your employees; they'll remain loyal AND deliver great customer experiences. You say I started out with practically nothing, but that isn't correct. We all start with all there is, it's how we use it that makes things possible. And culture means doing the right thing when no one is looking. Be open and candid with your customers. Don't make excuses; just resolve the issues and keep customers in the loop during the process. If there is any one secret of success, it lies in the ability to get to the other person's point of view and see things from that person's angle as well as from your own. Clearly the "other person's point of view" in the world of CX is your customer's point of view. Walk in your customers' shoes. 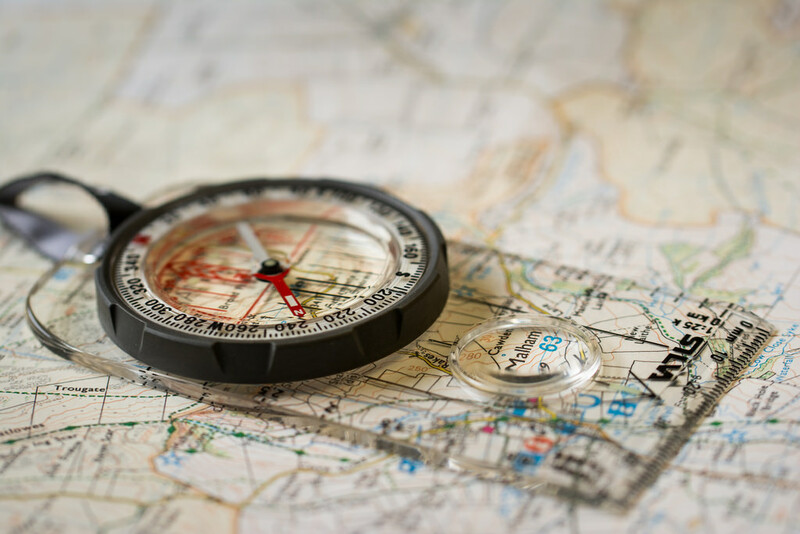 Map the journey from the customer's viewpoint. There is one rule for the industrialist and that is: make the best quality goods possible at the lowest cost possible, paying the highest wages possible. It doesn't get any more straightforward than that. Deliver quality to your customers while taking care of your employees. Ford was a huge proponent for paying top dollar. While it's not always about the money, he certainly thought outside the box on this topic when no one else did. Blaming is unproductive. The customer is not always right, but isn't it easier and more of a delighter to just solve the problem without question? If there's a problem, and you solve it right the first time, customers are typically more satisfied than if there hadn't been a problem at all. Employers only handle the money – it is the customer who pays the wages. Peter Drucker said it slightly differently: the purpose of a business is to create customers. Important words to operate by. Be ready to revise any system, scrap any method, abandon any theory, if the success of the job requires it. Process improvement is an important part of customer experience management. Competition whose motive is merely to compete, to drive some other fellow out, never carries very far. Don't just focus on the competition. Focusing on the competition is not a business strategy. It's lame. The competitor to be feared is one who never bothers about you at all but goes on making his own business better all the time. That quote reminds me of this from Sean Covey: "...a story I once heard about two friends being chased by a bear, when one turned to the other and said, 'I just realized that I don't need to outrun the bear; I only need to outrun you.'" Businesses that grow by development and improvement do not die. Every success is the mother of countless others. As far as competition is concerned, that must continue. But we must learn what competition really is.It is a striving to attain the best. To throttle it would mean to stop all progress. Certain men do not need to compete. They are pioneers. 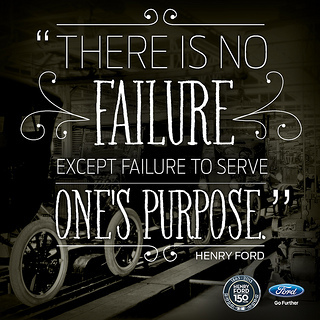 In the Ford Motor Company, we emphasize service equally with sales. This is a point I've had to iterate and reiterate often in my career. Sales brings in the business. But service delivers on it and keeps it. The keeping part is pretty important given that the bringing part can be costly. They are both important. Did I mention? Vision and Purpose trump everything else. Your vision tells customers and employees where you're going, and your purpose provides the why and is your guiding light. Yup. Focus on your customers; the profits will come. There you have it... my favorite Henry Ford quotes. Want more? Check out The Henry Ford site. What are some of your favorites? Today I am pleased to present another guest post by Kena Amoah. Understanding customers has been echoed by a lot of writers and bloggers. It is one of - if not the - most important factors for a successful business. The main reason for collecting information about customers is to improve the quality of the service you provide, hence gains their loyalty. A business cannot survive without making ongoing efforts to better understand customer needs, making customer care the number one priority of every business. Knowing your customers could be for various reasons, no matter the reason it should result in improvements or a better relationship. Also, great customer care involves getting to know your customers so well that you can anticipate and determine their needs and exceed their expectations. But how can this be realized? Based on the nature, diversity, demographic characteristics, and how large the customer segment is, there are different ways to better understand them. However, there are some basic approaches that can be applied by every business to understand its customers. Put yourself in your customers' shoes. If you are part of a management team of a business, you are a customer to other businesses or even to the business you manage. This makes it extremely easy to position yourself as your target customers. Try to answer the following questions “Am I safe with this product or service?” or “If I was using this product or service, what could I have demanded for versus what is currently provided?” Answering these questions will help you improve your business. Understanding customers also demands figuring out the points at which your customers reach your business. These could be meetings and visits, phone calls, correspondence, and deliveries. For instance, if it is through visits they reach you, then a good reception will do the magic. If it is any of the other channels, make sure things are made easier for them to freely contact you. With this, customers relate better and tell you what they think about your product or service. 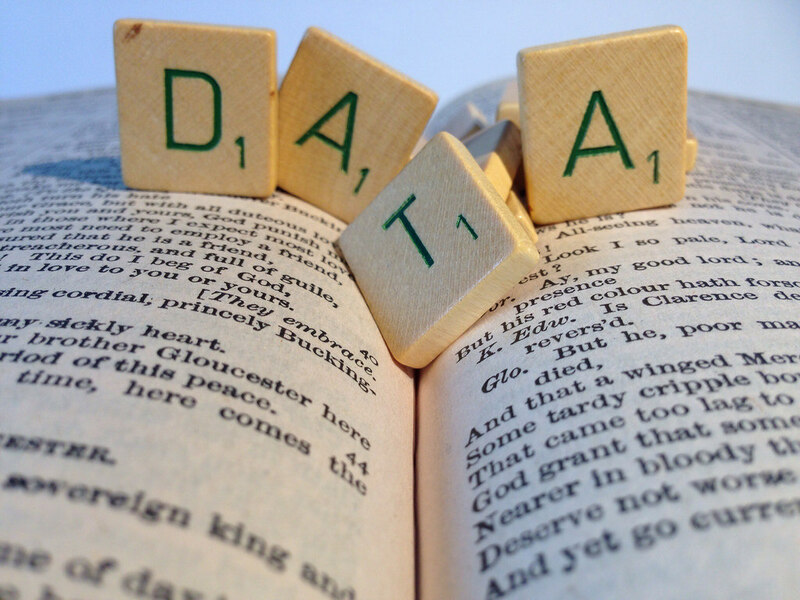 Using data to understand your customers is part of the game. Does your database or customer relationship management system (CRM) holds valuable information about your customers? If not, then have a system that will. With a database that holds relevant information about your customers, patterns can be identified. Such patterns can help predict customer-buying behaviors and adjustments thereby can be made. Know your competition. Researching the competition will provide valuable insights. If you researched about the best-performing company(ies) in your industry, it will reveal to you what customers want. On the other hand, researching into the poor-performing company(ies) will reveal to you what customers detest. The most important of all is direct feedback. Reaching your customers directly by picking up the phone and having direct contact with them is the most enlightening customer feedback you can get. It guarantees nothing but a personal conversation that will give you an opportunity to better understand your customers and their preferences. In addition to the above, ask your customers what they think. Conducting a customer satisfaction survey is a very important way of unveiling customer preferences. You will gain valuable insights. 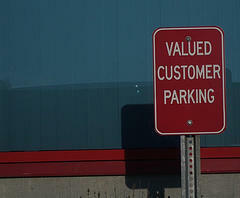 An additional benefit is that it will help to make your customers feel valued. However, clearly identifying your different customer groups before you carry out the survey will help you to select questions that are most relevant to each customer. In a nutshell, every member of your business, from the front desk to the delivery staff, should focus on exceeding customer expectations. Understanding The Customers is Key.